The i8 shone brightly in California; can it do the same here on British roads? "All I need you to do when he gives you the signal is floor it. Brake when you pass the cones and then you'll see the gate to take you out". For a car as pioneering, technologically advanced and modern as the BMW i8, to be introduced to it through a discipline as rudimentary as an airstrip drag feels rather incongruous. Incongruous maybe, but it proves a point. 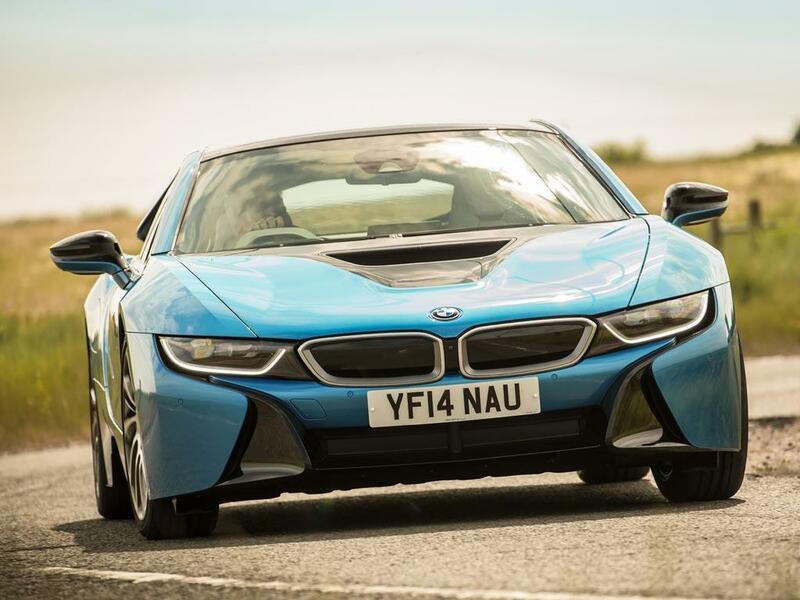 From the passenger seat a watch to speedo guesstimate puts 0-100mph at around 12 seconds with the i8 still pulling fairly hard into three figures. If any doubts were harboured about the quantity of the i8's performance, they were certainly allayed before we hit the road. Forming first impressions of a car from the passenger seat is intriguing as it reveals facets of the car's character sometimes invisible from the driver's seat when you're occupied with, er, driving. Immediately there's an inherent sense of stiffness from the car (a carbon body sits on an aluminium chassis), allowing even Sport mode to feel fairly compliant. You hear road detritus clanging around off the carbon in the arches and a total absence of wind noise that highlights some roar from the tyres. Then you begin paying attention to the traffic more, witnessing the stares of incredulity from other road users. If the i8 looks fantastic in isolation, its avant garde style is then starkly exposed and admired in the real world. Combining almost sci-fi details with a fairly conventional supercar silhouette makes the i8 look futuristic but still really exciting and desirable in a conventional sense. Features from the beautiful M1 Hommage are incorporated nicely too. If the i3 sometimes appears almost wantonly awkward, the i8 could easily be categorised as bedroom poster fodder. It's a stunner. So the i8 feels like special from the passenger's seat but it's something else again from behind the wheel. Dihedral doors appeal to your inner 10- year-old, the naked carbon weave to the geek and the excellent seating position to the driver. Regardless of the eco credentials, it puts you in a fantastic mood to drive. 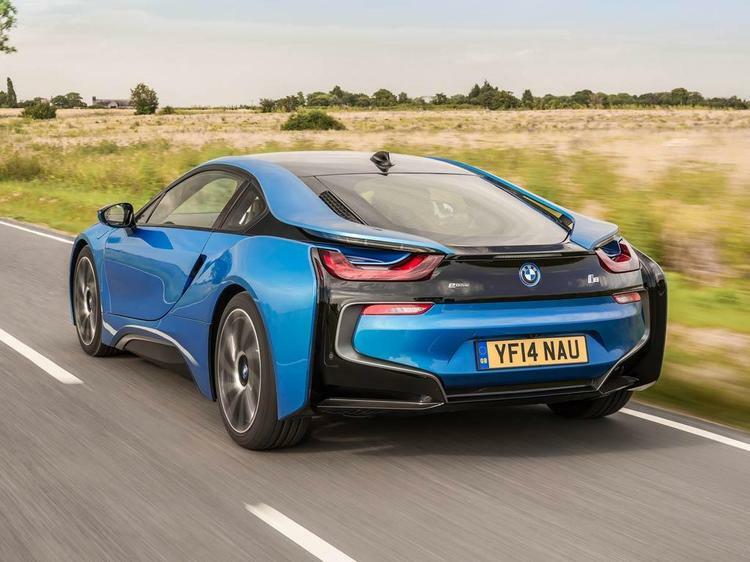 The i8 defaults to electric power whenever possible. Pushing the gearlever across to Sport automatically starts the combustion engine and the 1.5-litre three-cylinder turbo fires with an abrupt gurgle. On the road the engine makes a myriad of noises, all six-cylinder like in some form or another. At low revs the sound has the character of a flat-six, quite uneven and offbeat. But then it revs round to a low 6,500rpm limit with something akin to a V6 howl whilst retaining the smoothness of an in-line layout. The noise is enhanced, yes, but the Mini Cooper lineage is discernable. It feels augmented rather than artificial, building on what is there rather than devising an entirely fake soundtrack. Always augmented by the batteries, it's hard to get a true impression of the engine's characteristics. Unsurprisingly the sense of torque predominates, the i8 punching really hard from low revs and sustaining it apparently throughout the rev range. But then this is where the i8 arguably loses out to conventional rivals; the Aston V8 Vantage, Porsche 911 and Audi R8 all rev beyond 7,000rpm and are in their element at those engine speeds. 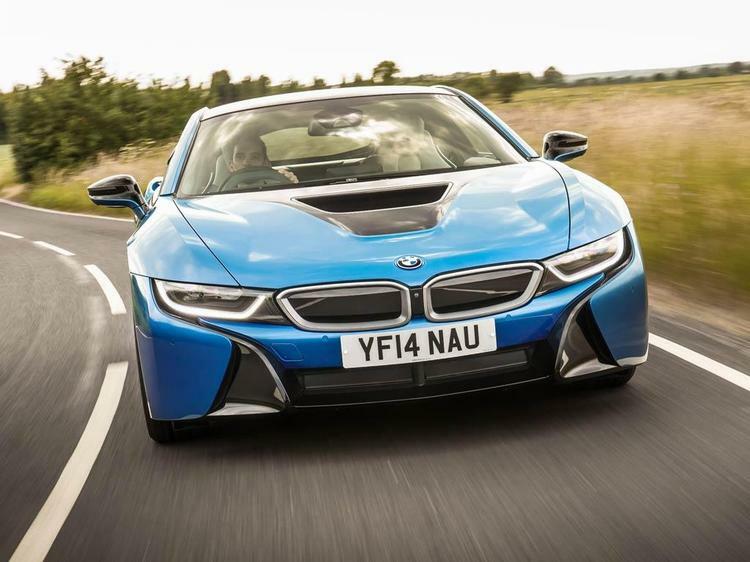 However, if a high-revving multi cylinder engine is that much of a priority for a sports car customer, would they ever be considering an i8? As a hybrid it offers another strand of engineering intrigue and, as will be discussed, its own attributes and appeal to the enthusiast. The six-speed auto is fine without ever feeling exceptional. The paddles are responsive and the manual changes are swift but it doesn't have the rapidity of a DCT or the consummate smoothness of the ZF eight-speed. Because there's little incentive to use every single engine revolution a slightly different driving style is adopted for the i8 on some excellent roads. And that's the key with the i8; different needn't mean worse. Chris noted some understeer out in the tight Californian canyons but in Scotland that wasn't a problem. The vast, sweeping A-roads really played to the i8's strengths. Its low centre of gravity and wide tracks give it a fabulous sense of stability through long, fast curves, the incisive turn-in imbuing real confidence. The steering isn't alive with feel but it is consistent, meaning your initial input is very often the right one. After the fairly poor M135i steering (it had to be mentioned somewhere), the steering is pretty good. Using fourth and that abundance of torque you very soon find a beautiful flow with the i8, minimal steering input guiding you from curve to curve. Ultimately it doesn't involve and engage in a similar way to something like a V8 Vantage, but it's far from unenjoyable. As has been echoed elsewhere though, to find a fairly unadventurous dynamic balance behind such bold design an engineering does disappoint a little. The i8's brakes are particularly noteworthy though. Given the technology involved with recuperating energy, that the pedal retains decent feel and is responsive to minute inputs is a laudable achievement. Left foot braking is facilitated too; cover the pedal through slower turns and the sense of acceleration and great traction is even stronger when you exit. The i3's party trick of driving almost entirely with one pedal isn't possible though as the regen effect just doesn't feel as pronounced. 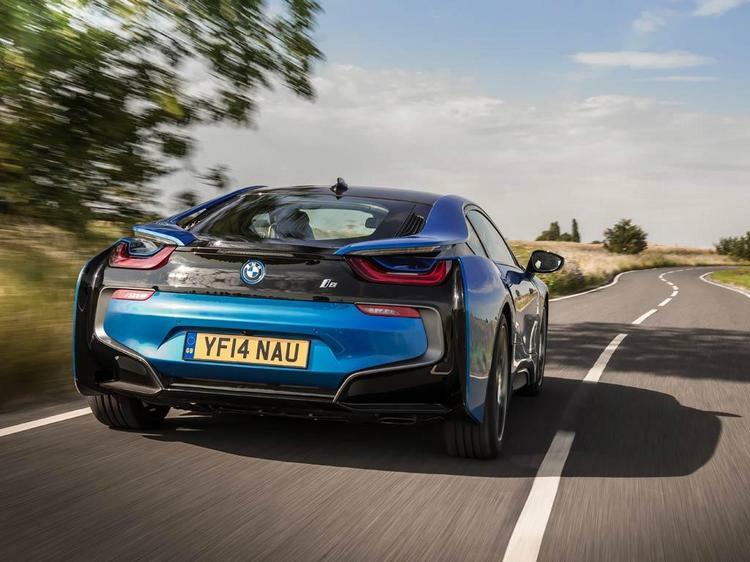 Perhaps you won't be perfecting heel and toe or finely trimming your cornering line on the throttle but there are new challenges with the i8 that require nuanced driving. Can solely regen be used through this series of bends without touching the brakes? Can enough energy be reclaimed to finish the journey on electricity? Can I maintain enough pace using just the eDrive mode? The dash displays are engrossing (if frustratingly complex to read sometimes), showing stored energy and when the battery is being replenished as well as the speed, revs (in Sport mode) and range. Is 200 miles from a fill good enough? The tank is only 42 litres which must contribute and driving in a less spirited fashion will of course make the claimed 343-mile range more attainable. 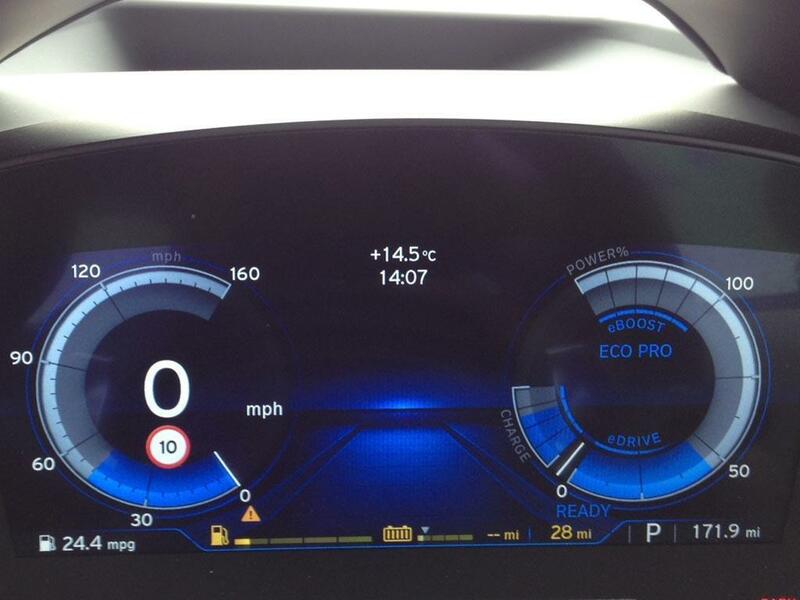 BMW claims over 400 miles in EcoPro mode which would be interesting to investigate. The serenity of electric motoring is quite pleasant after a sustained period nearly flat out. 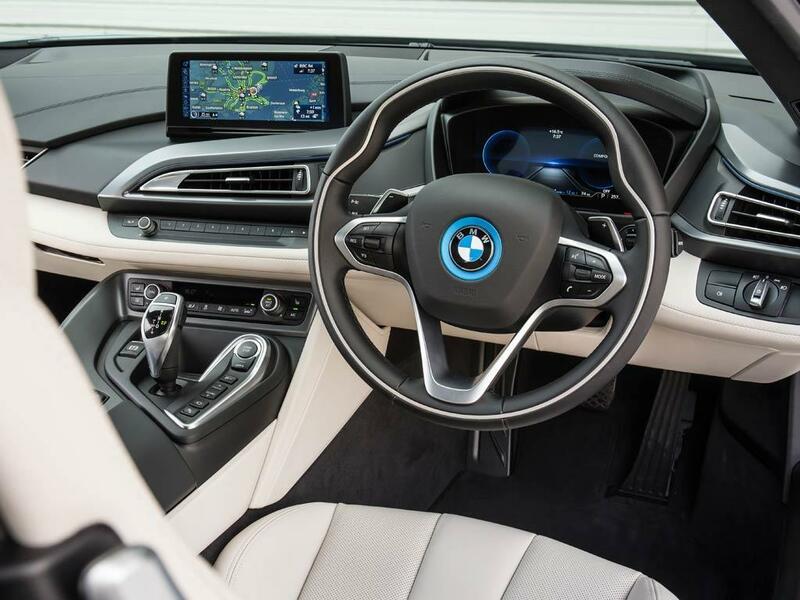 Similarly to the i3, the i8 will be offered with the full roster of BMW 360 Electric EV support services including chargepoint subscriptions, an app and reserved parking at charging stations. A wallbox charger can replenish 80 per cent of the battery charge in less than two hours and there's even a solar charging garage if you live somewhere particularly sunny. 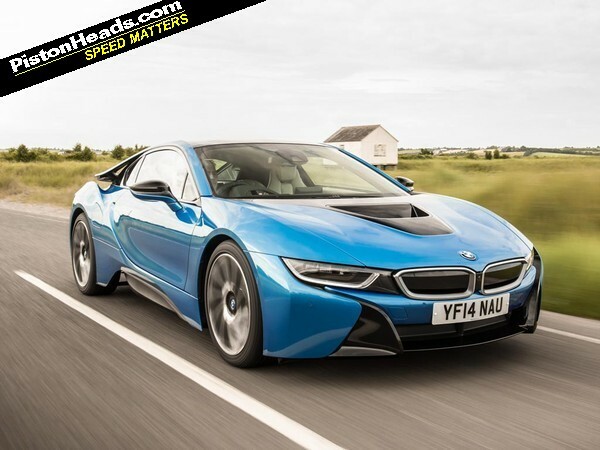 But other than a small question mark over range, the i8 absolutely excels. To judge it by conventional assessment criteria almost seems a disservice to how innovative the car is. But those are the ones that exist for now and the fact the i8 performs so well against them proves unequivocally how well honed it is. The Vision Efficient Dynamics concept was a superb idea now executed in the i8 with great style, meticulous engineering and huge desirability. It's magnificent. Price: £99,845 excluding Government ULEV £5,000 grant (£104,920 as tested including £1,150 20-inch BMW i W-spoke style 470 wheels, £1,490 for Driving Assistant - comprising rear view camera, surround view camera, high beam assist, forward collision warning, pedestrian protection, city collision mitigation and speed limit info - £295 for Anthracite headlining, £1,150 for Carpo interior world, £95 for Internet and £895 for Harmon Kardon loudspeaker system). It will be interesting now to see how these cars age into the second hand market once the batteries get to 10-15 years old, how often will they require replacement and at what cost, I'm assuming that this point won't affect it for business lease deals but in the private market someone's going to have to foot that bill somewhere. Astounding car and really feel now that the manufacturers are cracking the range / performance / vehicle cost. Another 5-10 years and I can see a lot of the business mile munchers being versions of this I8 type powertrain. 134 mpg is incredible, well done BMW. 24.4mpg am I reading this right? In real world driving using both electric and petrol that's all you managed? It's a joke that the official consumption is 134mpg, but drive it like a sports car and it's 24mpg. The EU emissions cycle needs a big revamp.